The aim of the study was to identify and describe changes in two different sandstone types when undergoing different environmental and extreme temperature regimes to assess the possibility of finding insolation weathering and how these sandstones would behave during and after a fire. The first step was the simulation in the laboratory of temperature regimes up to 60 °C which would correspond to extreme events that could be found in insolation cycles even in Central Europe and the second one was the temperature above 200 °C simulating in laboratory conditions the thermal regime of a potential fire situation at temperatures up to 200, 400, 600 and 800 °C. Heating the samples above 400 °C led to gradual changes in mineral composition, colour, surface roughness and physical properties reaching, eventually, total rock breakdown through spalling and granular disaggregation. The different behaviour of sandstones exposed to high temperatures is mainly caused by their different mineral composition with various ratios of minerals that are more or less chemically stable at high temperatures as well as by the differences in the porosity. This work was supported by the Slovak Research and Development Agency under the contracts No. APVV-0641-10 and No. APVV VVCE-0033-07 and by the Geomateriales program (S2009/MAT-1629) of the Madrid Regional Government. 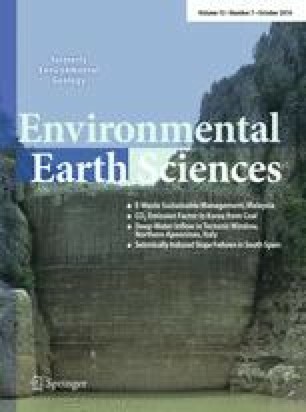 The authors are thankful the Petrophysics laboratory of the Institute of Geosciences (CSIC-UCM) in Madrid where fire-decay tests were carried out as well as the Institute of Inorganic Chemistry of Slovak Academy of Sciences in Bratislava where analysis and interpretation of IR spectra were performed.